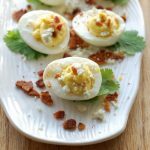 Blue Cheese and Bacon Deviled Eggs are a kicked up version of classic deviled eggs we all know and love. It’s that time of year again when hard boiled eggs will be easy to come by (Thank you Easter! ), and deviled eggs are always a great addition to every meal, especially big family get togethers. 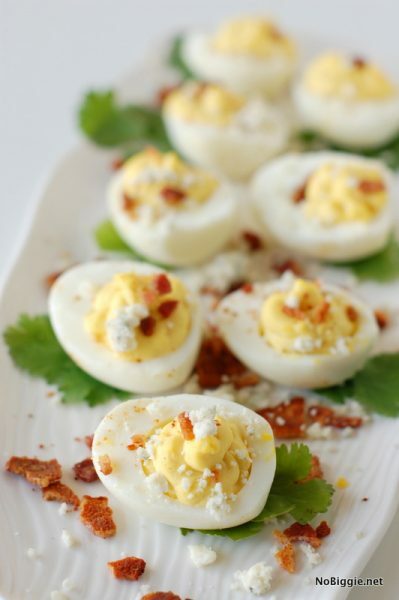 From Easter Egg Hunts to just delicious Game Day Eats, here’s a fun spin on a classic recipe: blue cheese and bacon deviled eggs. There is something so good about a creamy deviled egg topped with crispy salty bacon crumbles. It really is a fantastic flavor combination. Depending on how many guests are at your get together or party, plan on about 2-3 deviled eggs per person to be safe. Deviled eggs always seem to go quick at all our family get togethers, so I always make extra. Can these deviled eggs be made ahead of time? Yes! The key to making these deviled eggs a day or two in advance is to keep the egg whites and the egg yolk mixture separate. Also keep the crispy cooked bacon separate as well. Assemble the deviled eggs a few hours before your get together and keep them assembled in the fridge to keep cold. 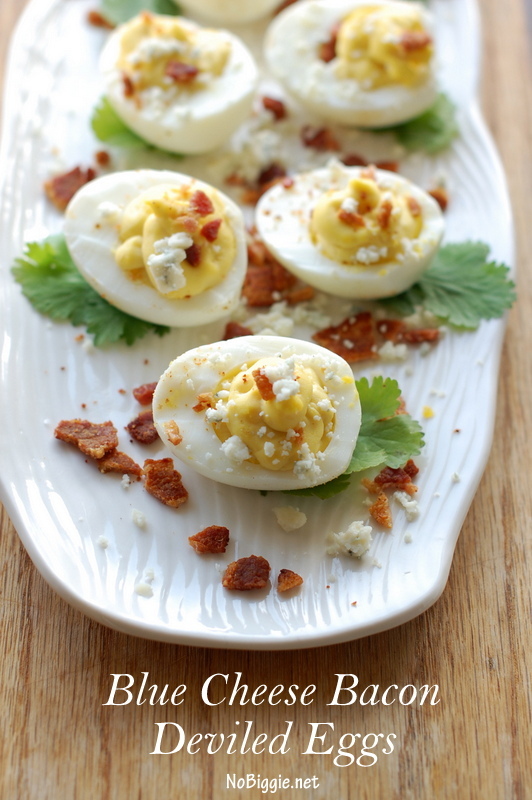 Take classic deviled eggs to the next level with creamy blue cheese and crispy bacon. Hard boil the eggs. In a medium pot with a lid cover the eggs with cold water and bring it to a boil. Once the water starts to boil. Turn the heat off and leave the pot on the heat for 10-12 minutes covered with the lid. Move cooked eggs out of the hot water into ice water to cool the eggs. Cook the bacon. This can be done a few days in advance and it will keep in the fridge for a few days until you're ready to use. We love the "never peel an egg again method" which is basically just cutting directly through the shell of the egg with a serrated edge knife to speed things up and avoid needing to peel the eggs. Carefully spoon the egg whites out of the shell to avoid any egg shells going into the bowl, gently brush excess egg shells away. Place all the cut egg whites on a plate. In a separate bowl, add all the cooked egg yolks. Add in the blue cheese dressing, mayo, mustard and salt & pepper with the cooked egg yolks. Use a whisk to mix together. Using a small plastic bag, pipe the mixture into each egg white. Garnish with blue cheese crumbles and crispy bacon crumbles. Serve chilled. Make ahead: You can make these up to two days in advance, just keep the egg whites and the egg yolks separate until hours before serving. My family loved these deviled eggs. I’m tempted to boil more eggs just so I can make them again. Does your family love deviled eggs too?